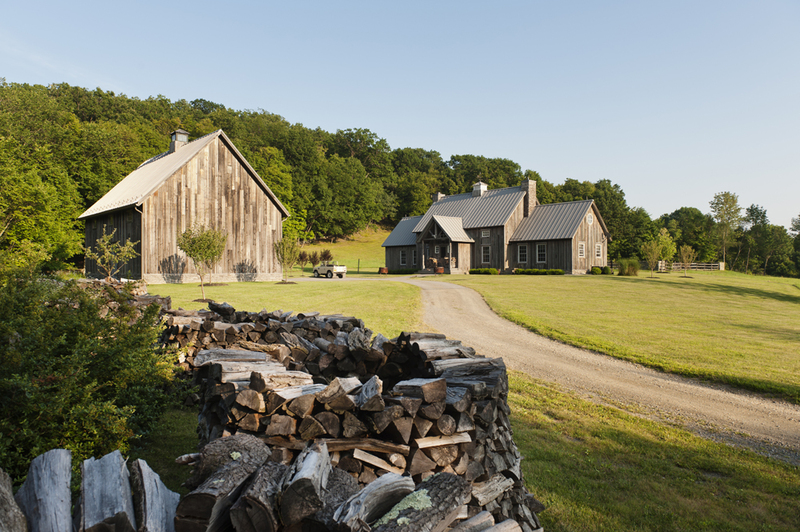 The designer's home in Milan, NY with exteriors featuring Hudson Company Reclaimed Brown Board Paneling. Photography by Andreas von Einsiedel for House & Garden UK. 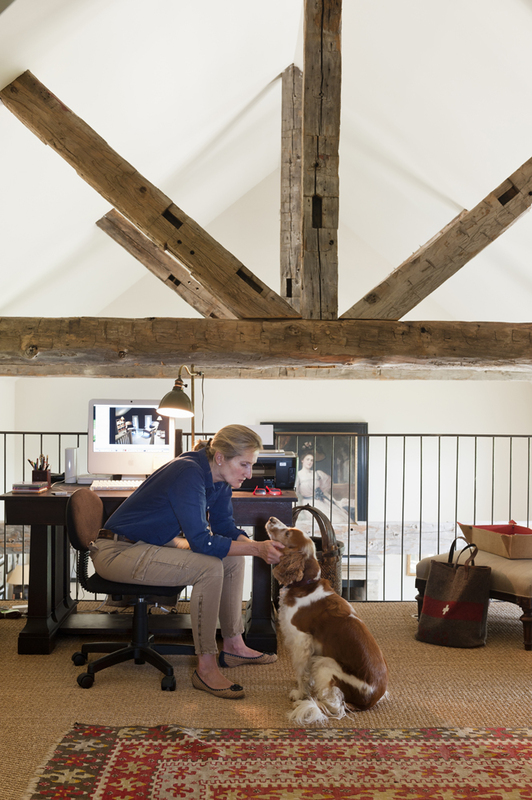 The home's interior, with Reclaimed Hand Hewn Beams by The Hudson Company. Interior designer Selina van der Geest moved to New York from London in 2000. Since coming to America, Selina has worked in the art and decorating business and has now opened her own eclectic showroom near Millbrook, NY, 90 miles north of New York City. After building her own house in Milan, New York, Selina was inundated with requests to add her unique style and organizational skills to projects for private clients. 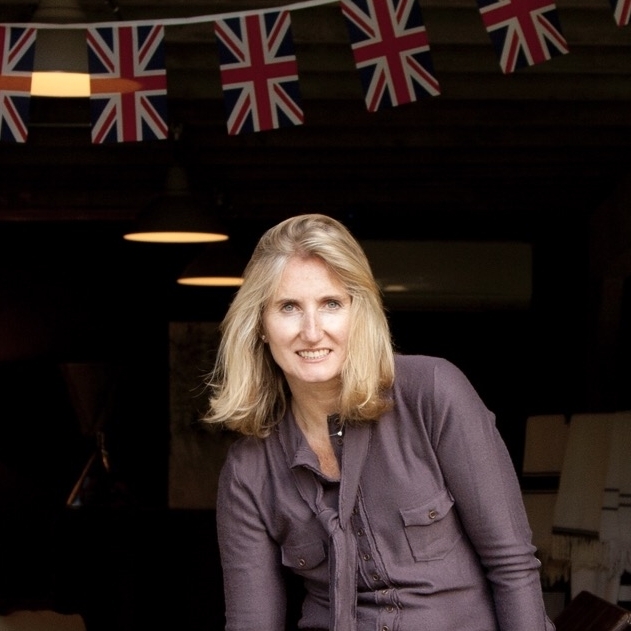 It has been a natural progression to continue the decorating business she started back in England, bringing a relaxed European feeling to her clients’ houses. She believes in working organically, reflecting in her designs and colors, the natural surroundings of the property she is transforming. Earlier this year, we sat down with Selina to discuss her work. Tell us a bit about how your time training in Europe prepared you for the work you do today? Well, I studied history and art history which gave me a great background for my work in interior design. I was lucky to combine both fields working for Colnaghi, the old master art gallery in London, designing stands and galleries as well as working with important art works. It was there that I learned woodworking and curtain making, thus giving me a very hands on approach to my work. The European aesthetic is different and has certainly continues to influence my work here in the States. How did you choose Upstate, New York as the base for your home and business? My husband, who is Dutch, bought a house Upstate in 1983, when he first came to America. I moved to New York from London in 2000 and since I share his love for the area, we purchased land in 2002 and decided to build a house. As soon as we finished the house, I was asked to help with other projects and so my work Upstate evolved. what is the red thread that connects all of your design interests? I am very inspired by nature and the environment around me, whether Upstate or on my travels. I often incorporate natural elements into my designs. Bottom line, I strive to create original homes and furniture for my clients and that's what drives me creatively. What can you tell us about the design process for your own home in Milan, NY? Before even buying the land, we bought an early 17th Century Louis XIII mantle in Bordeaux, France when we were there for a wedding. Then, we designed the house around this and a pair of antique Chinese doors. Coming from homes built of stone in England, I wanted to achieve the same sense of history and character in our new home Milan. The Reclaimed Brown Board Paneling we used on the outside of our house, immediately adds a sense of history and character. I stained the cut edge of all the batons, so we didn’t have fresh cuts showing. It also has the advantage of requiring less maintenance. Inside we have a large open room featuring Reclaimed Hudson Company Beams, which, along with the Bordeaux mantlepiece, give a very European character to the house. On the floors we used wide white oak boards, which we left untreated so they could develop a patina over time. The result is a home which feels very settled, relaxed and natural. What were some of the key design goals for your new home? We love cooking so wanted to have a big open space that would allow us to cook while also enjoying the fire and the living area. You enter through a mudroom with the large Chinese doors creating a welcoming opening into the great room and a view through the French doors to the pool beyond. We often have our family and guests staying and having separate bedroom wings and a guest apartment help to give us all space, but a wonderful place to congregate. We built the house in seven months and it was certainly an advantage to be on site daily. I spent many days shoveling snow or helping the framer when someone didn’t show up and nothing was delayed waiting for decisions. I also insist on a clean and tidy job site, believing that a messy environment encourages sloppy work. What's next for Selina van der Geest? I am working on a new house being built in Sharon, CT for a client whose apartment I designed in the city. We’re combining a traditional stone farmhouse with painted barn buildings, a stone potting shed and an English green house. The goal is for the house to feel as if it’s been there for hundreds of years and has evolved over time. Likewise, my goal is for the interior is to feel as if it’s been collected over the years, with interesting accents, textures and natural colors. Lastly, how would you describe your experience working with The Hudson Company? The Hudson Company have a wonderful selection of materials and a great aesthetic. From the sampling process to selection, they have listened and understood what we are after. Whether its a small order of individual planks and beams or a bigger order of pre-finished wood floors, The Hudson Company has always provided us with quality, professional services. Visit NLGB.com to learn more about Selina's work. Learn more about Reclaimed Hand Hewn Beams here and Reclaimed Brown Board Paneling here. Below is a sampling of more interiors by Selina, with photos by Jane Beiles for The New York Times. Jane Beiles for The New York Times (here and below).